Recently a group of La Fromagerie cheesemongers visited Fen Farm Dairy in the Waveney River Valley that marks the border between Norfolk and Suffolk in the eastern-most part of England. A bridge over the river allows the cows to graze on the Norfolk side of the water as well as on the Suffolk side, where the milking parlour and cheesemaking facilities are located. As Jonny Crickmore showed us the view of the farm from an overlooking nearby hill, he joked that his family had added the bridge to double their ‘local’ market - allowing them to appeal to customers in both counties. All jokes aside, their cheese is one of the most popular British cheeses in our shop, and, judging by the rate that we saw customers stopping in at their self-serve kiosk during our visit, it’s highly sought after in the local area as well. Fen Farm has been a dairy for sometime - Jonny’s family purchased the farm in the 1940’s and before that there was certainly cheese made there, though Jonny suspects it was not very good. According to Jonny, a few centuries ago, Suffolk became famous for its butter, which was sent to London and exported abroad, however the high demand of cream for buttermaking meant that dairies in Suffolk were left with only the skimmed milk and the resulting Suffolk ‘Bang’ cheese they produced was not great - in some cases, apparently, laughably bad. Dogs barked at it. A poem was written about it. Eventually the government ordered producers to stop making it because it was giving a bad reputation to British cheesemaking. Even today Suffolk is not an area known for its cheese, but that’s beginning to change in large part thanks to the work of the Crickmores and their team. Left: Our Cheesemongers getting up close & personal with the cows. Right: The classic Montbéliarde Cow, with its red colouring and furry top. But Jonny hadn’t initially set out to make cheese - that eventually came about because of the low price they were being paid for their milk. In 2011 Jonny addressed this by convincing his parents to sell milk directly on the farm. To make it worthwhile, Jonny knew it needed to be unpasteurised in order to bring customers, so the Crickmores installed a raw milk vending machine - the first in the UK. After Jonny’s parents saw the success of this, he convinced them to start making cheese to get even more value. 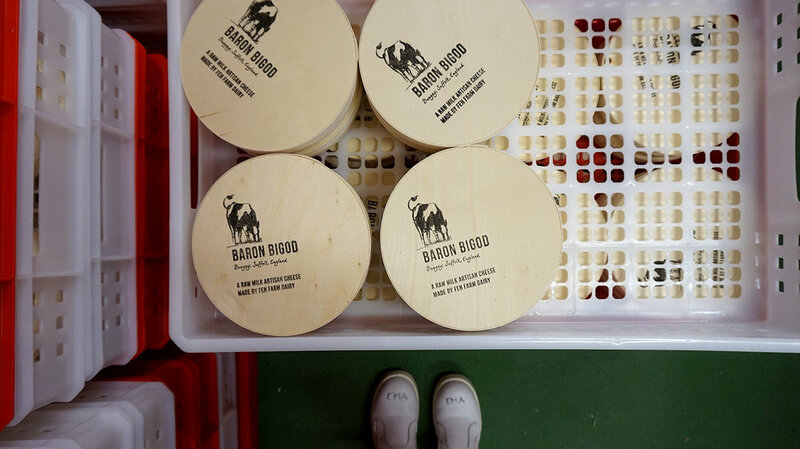 For a soft cheese like Baron Bigod, it takes 7 litres of milk to make 1 kilogram of cheese, but still, cheese is more profitable and converting milk to cheese lengthens the shelf-life, as well as diversifying the farm’s offering. Whilst a high-quality milk is the foundation of a high-quality cheese, making cheese requires a completely different process and skillset to that of dairy farming, and Jonny realised he needed help to get started. So Fen Farm enlisted French cheese consultant Ivan Larcher who insisted Jonny add Montbéliarde cows to his herd. Prior to that time, the farm had been using Holsteins. Known for providing a high yield, Jonny’s family had invested in Holstein herds, only to find that over time, this yield came at a cost. The cows became ill more and more frequently, and Jonny credits mounting vet bills for contributing to the closure of many dairies in the UK. Montbéliarde cows, distinct looking with red colouring and a mop-top of curly hair, originate from the Franche-Comté region in eastern France. They produce lower yields than Holsteins, but their milk has higher levels of the BB variant of kappa casein (a protein which improves coagulation of milk, allowing for better cheesemaking), and the cows have better longevity and fertility rates. In some cases, Jonny’s original Holsteins have been bred with the Montbéliardes, producing cows that appear as a cross between the two, generally black in colour but still with the distinct curls. When we arrived at the farm that morning just after 8 AM, the sky was dark with impending rain. On the way to the grazing pasture, we stopped for a moment to see the rennet and cultures being added to the milk from the morning milking. This is the first step in cheesemaking – rennet acidifies the milk and causes it coagulate, which starts the process of the formation of curds. On Fen Farm, the cheesemaking happens directly adjacent to the milking parlour, so the milk only has to travel a few feet before it starts being transformed to cheese. As the winds picked up and with the first drops of rain, we moved to the dairy just in time to miss getting soaked, and also in time to see the cut curds being ladled into moulds. The room where the curds are ladled could not be more different from outside – warm and humid, we wore white boots and smocks to keep our feet and clothing dry, and I regretted not removing my jumper beforehand. A cheesemaker invited us to taste the curds: so smooth and silky, with an intensely sweet and creamy flavour. 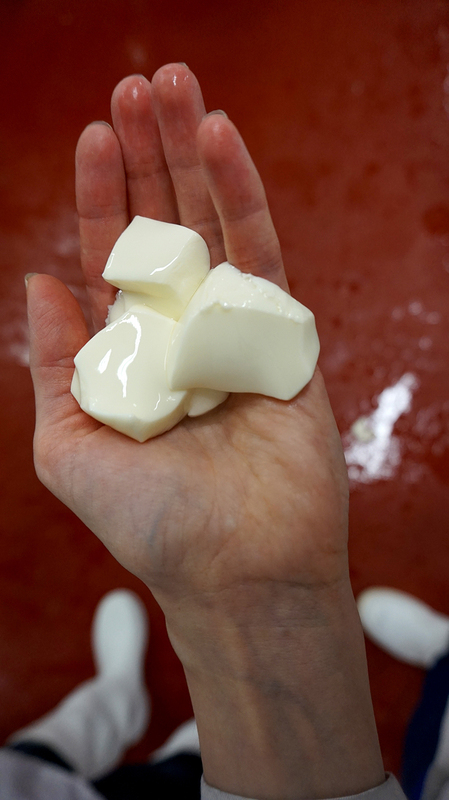 In my hand they felt like a loose homemade silken tofu, or the lightest panna cotta, and were much larger than the curds of harder cheeses, which are milled finely and pressed to reduce the moisture, producing a denser cheese that keeps for a longer time. Baron Bigod, however, is a brie-style cheese with a melting pate, so a larger, less processed curd is desired. 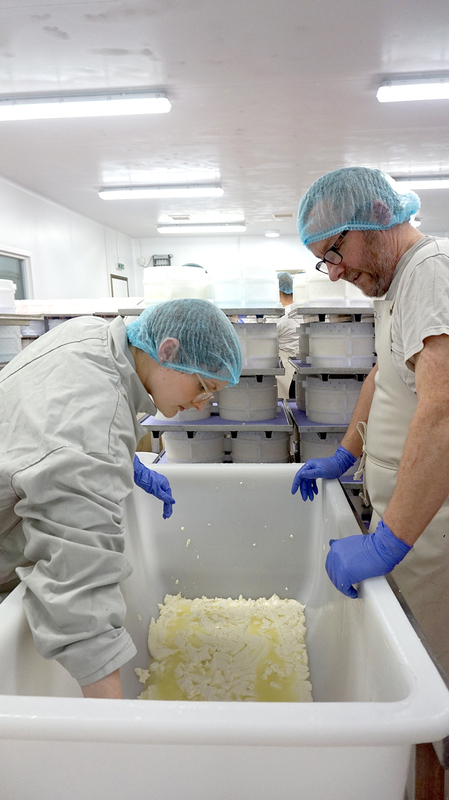 As we each took a turn ladling the curds into the moulds, we saw how difficult it was to work quickly but delicately, not wanting to damage the curds in the process. The stacked, perforated moulds allow excess whey to drain out, and I was taken by the vibrant, energy-drink yellow colour of the whey. 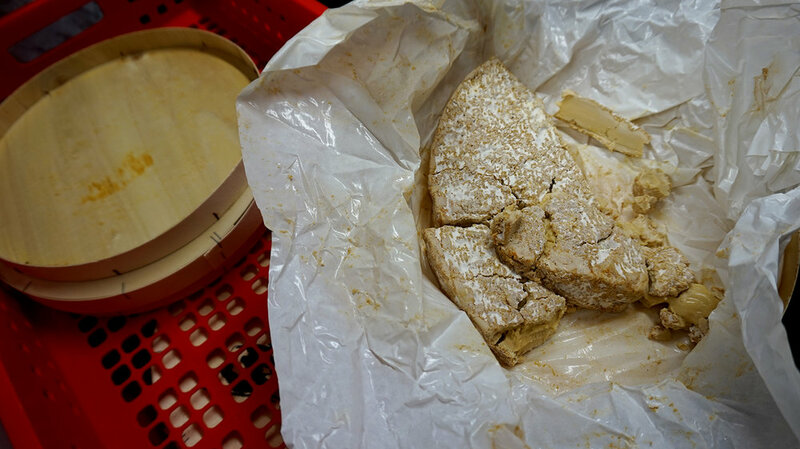 After draining overnight, the cheese is unmoulded and salted, and the moved to an adjacent room which is kept at 16 degrees, where it will remain for 3 days, getting flipped every day during this time. After that, the bloomy moulds (Jonny uses a mix of geotrichum and candidum) should be established and the cheese is moved to a colder temperature where is it matured a few weeks until it is the desired consistency. Jonny and his team finish each week tasting the batches of cheeses, making notes and rating the flavours and textures, and logging this alongside the actual data of pH and temperature over time, which is measured during the cheesemaking process. As Jonny points out, there are so many variables from day-to-day, with cow’s diets and milk yields varying (some of the cows are fitted with collars where some of the information about when they last calved and their milk volumes are stored so that the team knows when to rotate them in and out of the milking). Thus they must do everything they can to control as many steps of the process as they can, and they are always testing, always evaluating, always learning. It’s been about seven years since Fen Farm started producing Baron Bigod, and it’s amazing to think what a classic British cheese this has become, and in such a relatively short amount of time. Since producing Baron Bigod, Jonny has also started making Bungay Raw Butter. Jonny considers it a sort of homage to the region’s former reputation to buttermaking - a reputation lost a couple hundred years ago - and indeed, Fen Farm’s butter is made by hand on the farm in the traditional way, beginning with the warm milk from their Montbéliarde cows, which is cultured, churned and hand-paddled. It is the closest thing to the original Suffolk butter, and it has a beautiful, complex flavour that has become a favourite in our shops. 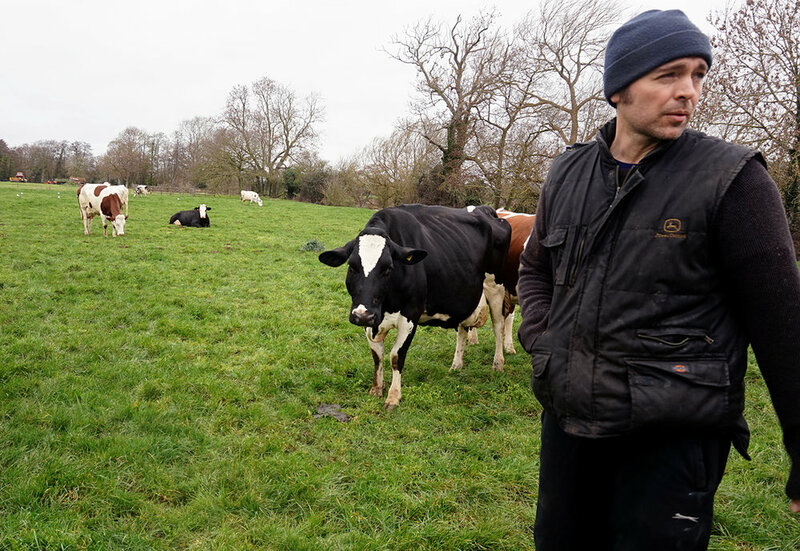 Jonny’s drive, tenacity and willingness to try something new has driven forward his family’s farm, and has helped restore Suffolk’s tradition of dairying. Unable to sit still, he seems to constantly have something up his sleeve. Whatever he decides to do next, we can’t wait to see it. A special side-project Jonny has been working on: Baron Bigod Black (in the style of Brie Noir) - this is cheese that has been aged well past its usual ‘best before’ date. This batch we tried was from December 2017 (over a year old). The colour is obviously much darker, and the texture, as you might expect, is dense and fudgy. The flavour is spicy and punchy, to say the least, but moreish in a strange way. Jonny Crickmore has come into the world of cheesemaking with the desire to make his family dairy farm more diverse. He has invested in a herd of alpine Montbeliarde cows from France, created pastures that have the right grazing conditions, and dedicated himself and his cheesemaking unit towards making what is, in our opinion, a very fine Brie. It takes the skill of an affineur to bring everything together – for the rind to have the right blooms, for the pate to be rich and not over-runny or -chalky, and for a combination of flavours to balance as you taste. This is a tricky test for a cheesemaker and we feel Jonny Crickmore has succeeded in developing the style he wanted for his cheese. Fen Farm’s Bungay Raw Butter is the UK’s only raw farmhouse butter produced by using a lactic culture. It is made by hand on the farm in the traditional way, by culturing, churning and hand-paddling with traditional scotch ‘butter hands’ made from wood. It is the closest thing to the original Suffolk butter that at one point gained international renown for the area 300 years ago. A true farmhouse butter.